10-25-02 Yesterday was the first day that I started making pots again. I got the bats and the clay out. THANK GOD! I got involved in a couple of art projects that ate up the month of October and are close to completion. I have not done the biweekly update as promised because I have nothing to show. So this time around, I'll show you things I used to make. I used to make lamps. Very elaborate lamps. This was before clay. 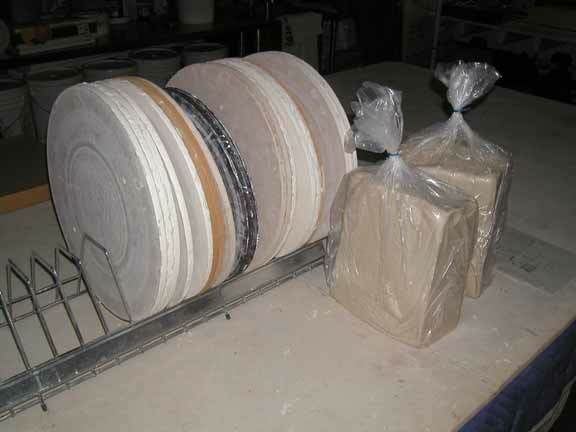 Now I still intend to make lamps, but now they will be ceramic bases with special shades. I can't wait to do that. I have made a number of pots that are designed as lampbases and have them sitting about the studio. In fact, I think I will take a break and take a couple of pics of them since this is a lamp related update! 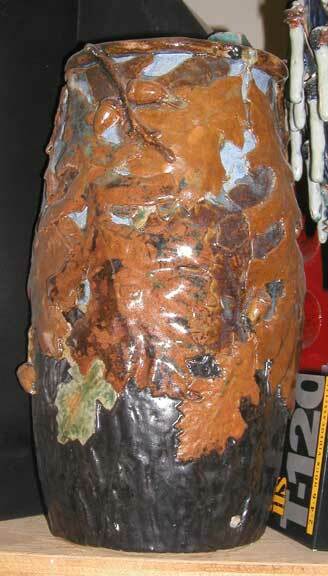 Ok, I am back and here are some of the ceramic lampbases before I show you my other lamps. 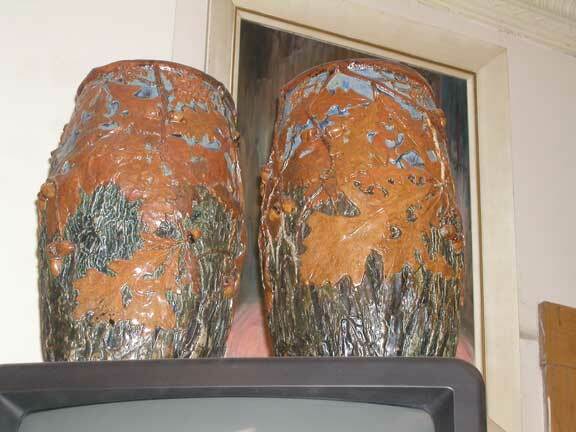 The first are two monster OAK TREE pots. Big and heavy- about 16" tall. I made thse in '94 and there they sit, waiting for shades. I have not made an OAK pot in years and considering how many people ask if they are for sale, perhaps I should make a few. Damn it, I will! I'll make a couple OAK pots this year. Here are a pair of two of the most beautiful pots I have ever made. They were fired twice and the glaze really ran as you can see. They are sitting up on a 10' shelf and dust covered. Here is a pic of oner cleaned up. 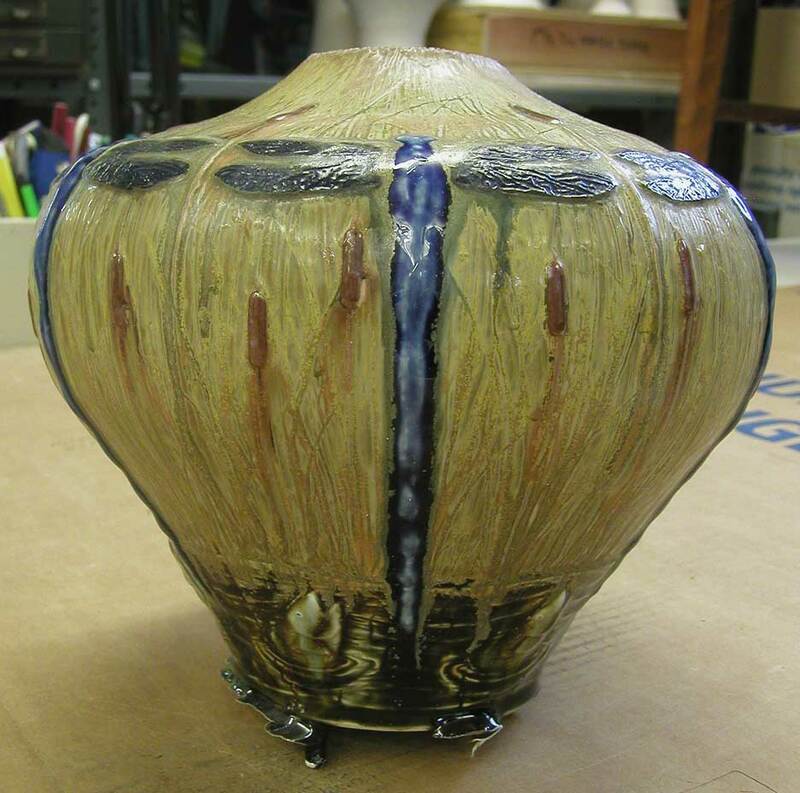 Incredible glaze. You can click it to see it close to actual size. I have some of the shade materials on hand for this pair. Copper and mica kind of stuff. I always envisioned a custom metal base to protect the base of the pot. The glaze drips will grind off. 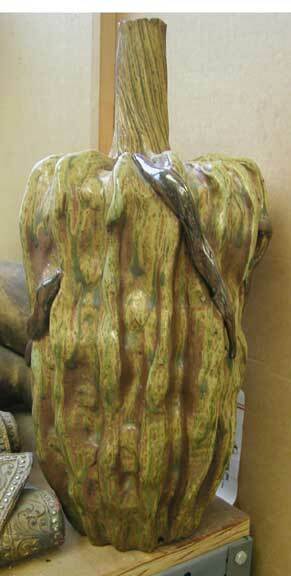 Here is a worm covered gourd meant for a lamp base that you have seen before. A shade made with those organic papers coming from Thailand would look good. I have more ceramic lamp bases around the studio. Now check out the lamps I made before clay. 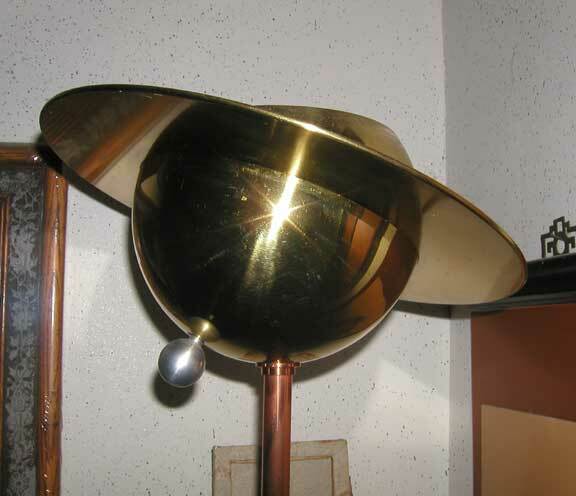 The first is my "Saturn Lamp." Solid copper and brass. Here is a close-up of the top which has three way light source- 75, 150, or 225 Halogen watts. The little aluminum planet is the switch and the lamp is 7' tall. 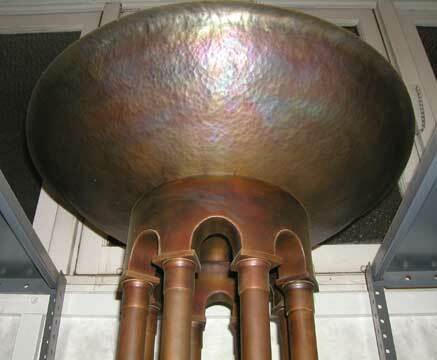 And the bottom- made of copper pipe fittings and sheet from 3/8" to 1/8". And now for something a little more elaborate. The next two lights are called "De lights of Western Culture." 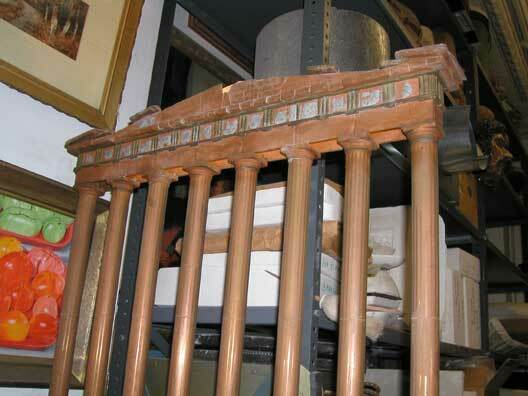 The first is my Parthenon lamp. 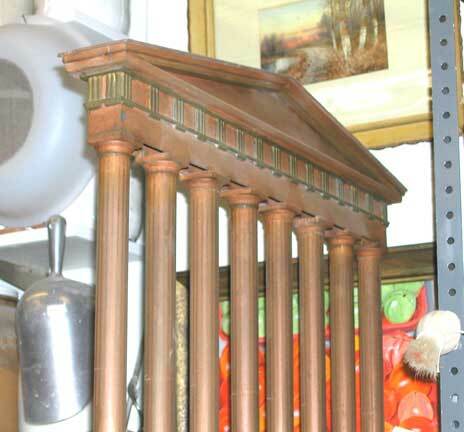 Modeled on the Parthenon in Athens it is all solid copper and one side depicts the Parthenon as it looks now and the other as it might appear as an "ideal" of Greek culture.. 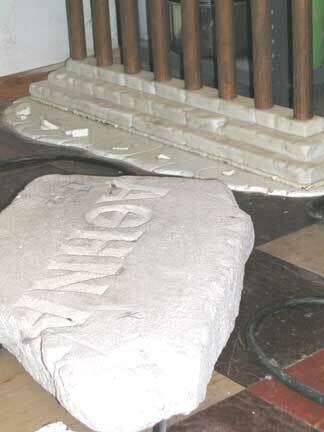 The base is marble and a 1/4' steel plate and the stone you see there is actually the switch. It is a piece of limestone that floats and you can step on one side to turn on a 20 watt florescent light that shines down between the pillars or the other side you can step on to turn on 300 watt which shine out of the top. It can be a mood light or an illumination light or both at the same time. Rewiring this lamp will be a nightmare. I have a box of spare parts- everything that can be replaced- bulbs, switches, transformers, etc. Also directions and the original drawings. Hope they don't get separated. But that is inevitable. Cause it is going to be around a long time. 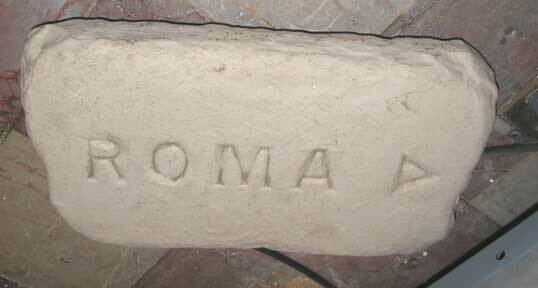 The other "De light of Western Culture" is my Roma Lamp, based on the Panthenon in Rome. Here is a picture the whole lamp which is not a very effective picture. It is 7 1/2' tall and I spent 1800 bucks on it in materials ten years ago!! I hammered that top using a bowling ball as my anvil. I bet the neighbors were glad when I finished that. I did it outside because of the noise! The lighting is very elaborate. There is a 500 watt halogen light in the center and then there are 60, 3 watt "flicker" bulbs lining the inside of the mirror lined bowl. 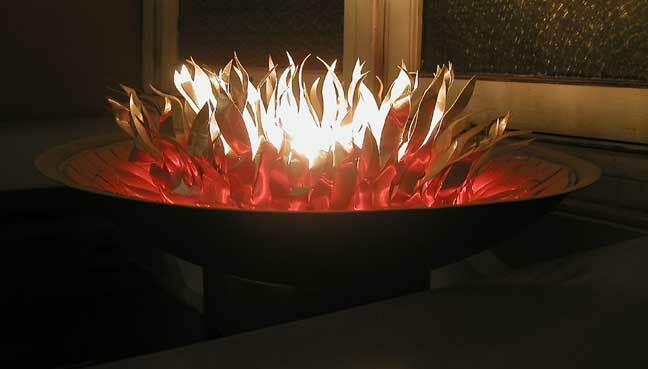 Above all that is a "fire" of thin mirror stainless steel sheet cut into flames. You can turn on the 500 watts or the fire, or both. This is a very elaborate lamp. All solid copper, brass, stainless and marble. It is 7 1/2' tall. 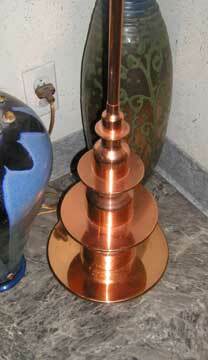 The top is a hammered sheet of brass and the arched piece below is all copper sheet rather meticulously formed. The base is marble and the switch is similiar to the Greek lamp where it is a big stone that floats above the two switches. You can choose the fire light or the halogen or both. This is a long page, thanks for you patience.